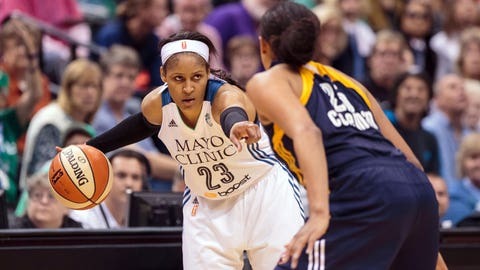 Renee Montgomery and the Lynx will battle Layshia Clarendon and the Fever in Indiana on Friday night. 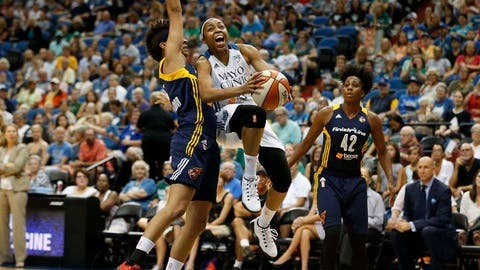 INDIANAPOLIS — Tamika Catchings didn’t get much sleep after her Indiana Fever lost Game 2 of the WNBA Finals to Minnesota. "We weren’t focused enough in the final few minutes and that’s what cost us," Catchings said at practice on Thursday. "The turnovers, the offensive rebounds, we just didn’t do what we needed to do to win that game." "It’s going to be a great atmosphere," Catchings said. "We always have great fans." "I’ve got to play the game the way I know how," she said. "I only know how to play one way. Sometimes you’ve just got to play through a lot of different situations and throughout my career that’s one thing that I’ve done." "They said just don’t do it again," White said. "I think the biggest message is just to keep it quiet, but I couldn’t keep it quiet at that point." White said that she told her players when they got back to Indiana to, "Leave your baggage at baggage claim and let’s focus on what we do." "We have to have the same mentality as we had before," Catchings said. "Obviously if we lose we’re not done, but we have to come with the same effort and focus." "We are comfortable playing on the road as we’ve shown this season," Reeve said. "It’s a big reason why I came here, to get a title," Fowles said. "It took a little while to get used to playing here, but now I feel I can be a bigger presence." GETTING FIT: The WNBA held a clinic for 90 kids with Fever players after practice. Catchings was at the defense station showing the youngsters the proper stance and getting them to yell defense. The five-time defensive player of the year had the kids show their best "mean" face as they were working on their defense.